The most senior bishop in the Church of England has said the Paris terror attacks made him “doubt” the presence of God. Justin Welby, who as Archbishop of Canterbury is de facto head of the Anglican Communion, the world’s third largest Christian denomination, said he was left asking where God could be in the suffering of the French victims. When asked how he first reacted to the attacks, he said: “Like everyone else – first shock and horror and then a profound sadness – and in my family’s case, that is added to because my wife and I lived in Paris for five years. Archbishop Welby’s response to the attacks is in stark contrast to other religious leaders. Pope Francis condemned the terrorist acts in very strong terms, saying it was a “blasphemy” to use God’s name to justify “violence and hatred”. “Such barbarity leaves us dismayed and we ask ourselves how the human heart can plan and carry out such horrible events,” he added. Other religious leaders have directly addressed concerns such as Welby’s as to why God can allow such things to happen. Fr Julian Large, Provost of the London Oratory, said in the wake of the attacks: “God never wills evil to happen, it would be against His nature, but He does sometimes permit evil to happen. “When He permits it, we can be sure He is sending a message for us and the world… God is surely calling us to our senses. He is calling the world back to Him. “When hatred, violence, fear and confusion threaten to engulf humanity, He is calling us to look up into the arms of Our Lord Jesus Christ, outstretched in love on the cross. The Anglican Communion is currently facing a split as its member churches argue over issues such as homosexuality and women’s ordination. 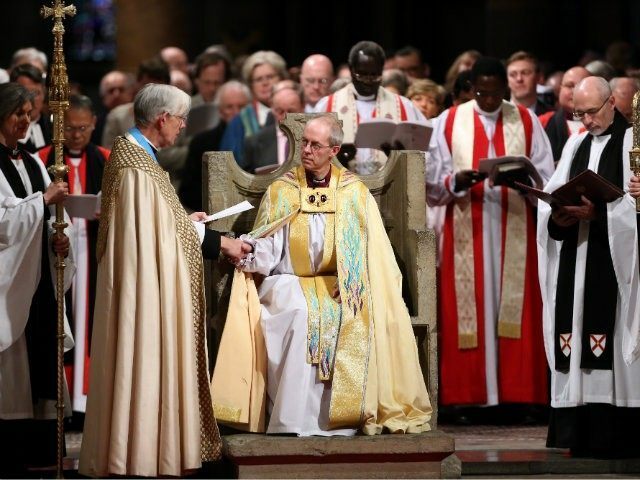 Archbishop Welby has summoned all 38 leaders of the various Anglican churches to an emergency summit in January where he may propose the formal dissolution of the Communion, reorganising it into a much looser association.